And is anyone out there surprised by the news? I heard it when I tuned in Peter Mallary filling in for Mark Johnson on WDEV. My first gut reaction was: Amazing that Benazir had survived this long since returning in October to her native Pakistan where her family had been a political dynasty and her father hanged. She was the first woman to lead an Islamic state. There the Harvard grad also served five years in prison - mostly solitary confinement. I won't pretend to know anything about "Pakistan" beyond how to spell it. It's 10:20 a.m. - no statements from Vermont's congressional trio... yet. "This is a sorrowful day for Pakistan and for people of goodwill across the globe. "This election is important in what it will show about the vigor of democratic institutions in Pakistan. The lack of real democracy and the crippling of Pakistan’s judiciary have been grave setbacks. The earlier protests by Pakistan’s lawyers in defense of the rule of law helped show the world what is at stake, and now, with this tragedy, the whole world again is watching Pakistan. "The people of Pakistan deserve to know that the people of the United States stand with them as they struggle to restore constitutional government and to prevail over thuggery. They will want to know that our military aid is no longer blind to their aspirations. And they need to know that we share their profound sense of loss." Oh, so sad to hear about this. 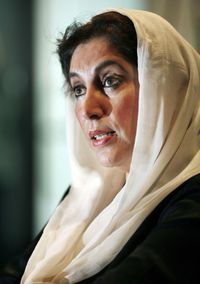 I loved her strength and her hope for Pakistan. Alas, this, and so much more that has been, and is yet to come, was just as inevitable as it was infinitely predictable, the day we decided to bomb the hinges off the Pandora's Box that is the Middle East. And the smug among us will be quick to say "I told ya so!" But how were those of us who were in fact predicting it so impotent in convincing our fellow citizens? It's because we no longer talk to our neighbors. We've allowed ourselves to become so fractured into interest groups that we seem to have no way to organize together when the immense issues that will change the course of history for us all emerge. And for our failure to talk with and organize with our neighbors, we, too, bear this blood on our hands. So this time, mourn AND organize, lest we fail our families again. It's really sad to see this happen but it was not unexpected only a matter of time. It's hard because here is a women who fought for equality and the right to become Prime Minister (again) and she was gun down for challenging the status-quo. Maybe I am naive, but hopefully we can do better in this country and elect a women President. I think it would be profoundly symbolic that a women deal with these people who treat women in such a disrespectful and low fashion. You can look down at me if you want, but that is why I think electing a woman President is a positive step in countering this kind of fear mongering. These sorts of things mean much more than what appears on the surface. I know some corporate high-ups who are really concerned about the stability of that region (not Iraq, but parts of BRIC). They are worried because US corporate infrastructure, that is now the backbone for much of US operation, is being migrated to BRIC. A spat between India and Pakistan could be crippling to the US in more ways than people know or expect. Dark and dangerous days indeed. We are in dire need of responsible and visionary leadership in this rapidly tanking world, but I'm not at all sure where that's going to come from. Losing Bhutto is most certainly crippling, as snow monster notes, and it's true we're completely unprepared for the fall-out. The first priority is to get a handle on the nukes. There's nothing more dangerous than 13th century mentalities getting access to 21st century technology. Bhutto's tragedy is only amplified by the fact she leaves the PPP with no other viable leader. Really risky and irresponsible move on her part. With all due respect, Scott, and this is not a put-down at all - I'm not so sure that electing this particular woman for U.S. president would be the symbol you hope for. I'd love to cast a vote for the first female president myself, but it has to be the right woman and for the right reasons. This one does not have a handle on sound foreign policy, despite a well-oiled electoral machine trumpeting otherwise. 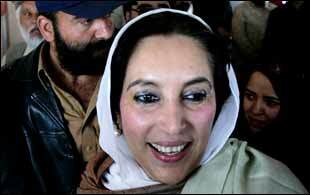 Bhutto's gender probably did play a role in the campaign against her and her policies, but it was not the only factor here. I can see that this unrest in the world could change the political landscape in this country. Elections here are about a year away, but with this incident and if we were to suffer a terrorist attack in this country, the voters will be turning to a candidate who gives the impression of being able to protect us. Although I am undecided at this point, I believe the American voter would turn to John McCain for protection. So much can happen before the election.